So this isn't exactly new, being issued in 2000, and it may well be that these are no longer available, but I have to provide something so here it is. There are two sheets in this pack and they are for all scales from 1/144 to 1/32. 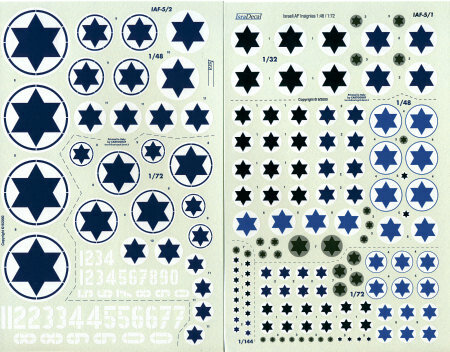 The instructions contain a guide that tells exactly which roundels fit on which aircraft. As you can see, there are a variety of shades and styles to choose from so having a photo would be highly recommended. In addition to the roundels, a series of white numbers as used on the Spitfire, T-6, Harvard and Meteor are given in 1/72 and 1/48 scale. If the IDF/AF is a passion for you as it is for many, it would be worth seeking out this set. Review sheet courtesy me so you will know what is out there. If you would like your product reviewed fairly and quickly by a site that has almost 400,000 visitors a month, please contact me or see other details in the Note to Contributors.